Well our stay in Palm Springs is officially coming to an end. We leave for Santa Barbara in the morning and it looks like it will be a wet drive unfortunately. 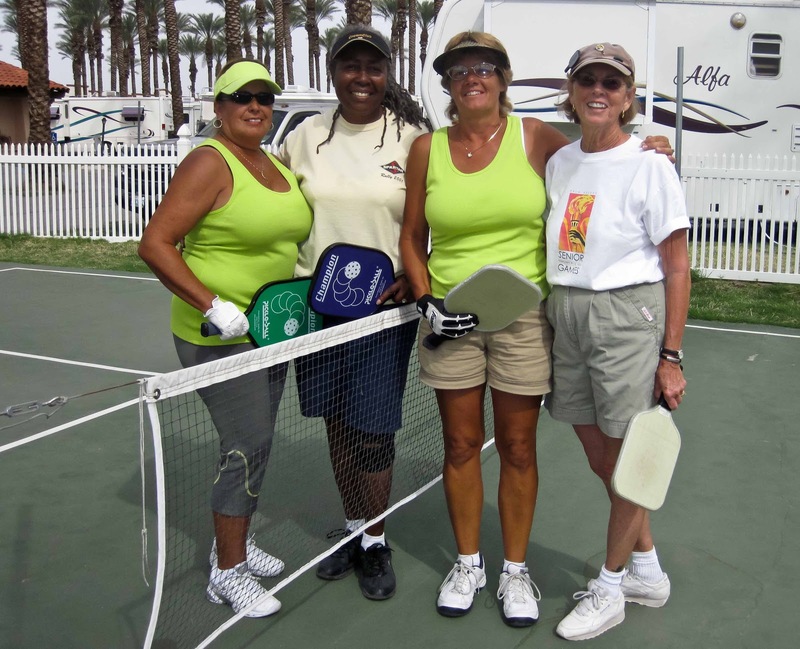 We have enjoyed our time here and the pickleball tournament these past few days was a nice way to finish our time here. We both played Thursday, Friday and Saturday and then Chris had to play in the ladies final this morning. 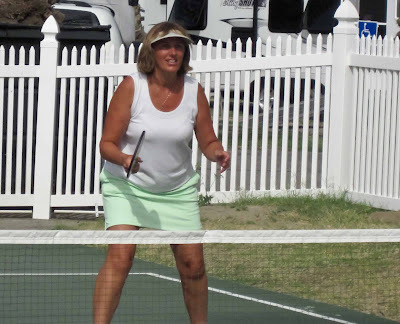 Way too much pickleball in the past week as far as we are concerned. A short video clip above of Chris & Judy as they played against Annie & Linda. Took this with our point and shoot camera. We both played well and the tournament was a lot of fun. I’m not exactly sure how the final standings were tabulated but Chris and four other ladies wound up playing Sunday morning for a couple of hours as well. 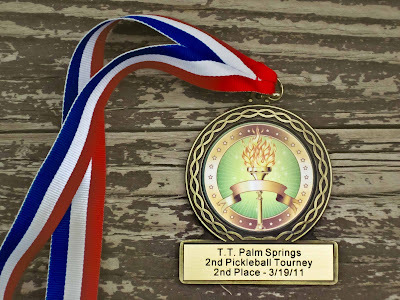 I managed to walk away with a first place ribbon, I think for Friday, and also a 2nd place medal, I think for overall standing. Chris came up short unfortunately. Judy (1st overall), Stephanie, Jim and Ken among others also medalled or received ribbons. We met in the family center afterwards for a late breakfast and the awards ceremony. Many thanks to Rick, Linda and Shirley Portzer for all their efforts in putting this tournament together. We spent the afternoon packing up PP in preparation for an early departure in the morning. With rain in the forecast, our touring bikes will make the trip inside the Vue. For the first time this winter we can actually see quite a few vacant sites here at TT Palm Springs. We’ll stop in at Sam’s Club in the morning to fuel up before moving onto Mike Thompson’s RV in Colton for a few repairs. Sam’s Club has diesel on for $4.10/gallon versus $4.23/gallon at Pilot/Flying J. Needless to say the drive back north to British Columbia will be more expensive than our drive here last fall. This entry was posted in California, Entertainment, Photography, Thousand Trails, Video. Knowing Judy and Faye, I really have enjoyed your posts and pictures of them.My husband Joe, has really missed pickleball this season and was so glad that he found a place to play indoor pickleball one evening a week while we are staying home taking care of elderly parents. Have a safe trip home.